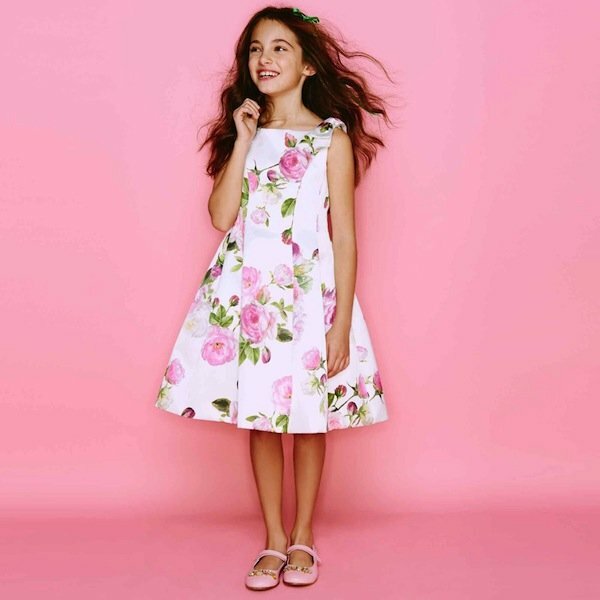 Love this stunning Monnalisa Chic girls stunning vintage floral print sheath dress in ivory cotton and viscose. This sumptuous design has an all-over antique floral print on panels of lovely satin effect cotton fabric. The style is sleeveless with bow shoulder detail and flares out slightly at the waist, with a concealed side zip for ease of dressing. Complete the look with a pair of pink ballet slippers and white cardigan cotton sweater. Adorable Summer Look for girls by famous Italian Kids Fashion House. Ships Worldwide.